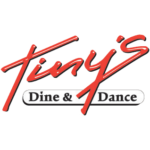 Tiny’s is a family owned and operated restaurant/lounge in Santa Fe for 65 years. Centrally located at the Southeast corner of Cerrillos Road & St. Francis Drive intersection. Near-by you see the Rail-Runner crossing the intersection numerous times daily from the entrance.